A cycloisomaltooligosaccharide (CI; cyclodextran) production system was developed using a Bacillus subtilis expression system for the cycloisomaltooligosaccharide glucanotransferase (CITase) gene. 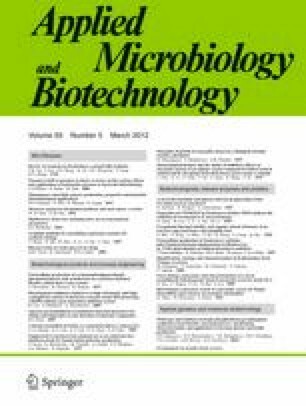 The CITase gene of Bacillus circulans T-3040, along with the α-amylase promoter (PamyQ) and amyQ signal sequence of Bacillus amyloliquefaciens, was cloned into the Bacillus expression vector pUB110 and subsequently expressed in B. subtilis strain 168 and its alkaline (aprE) and neutral (nprE) protease-deficient strains. The recombinant CITase produced by the protease-deficient strains reached 1 U/mL in the culture supernatant within 48 h of cultivation, which was approximately 7.5 times more than that produced by the industrial CITase-producing strain B. circulans G22-10 derived from B. circulans T-3040. When aprE- and nprE-deficient B. subtilis 168 harboring the CITase gene was cultured with 10% dextran 40 for 48 h, 17% of the dextran in the culture was converted to CIs (CI-7 to CI-12), which was approximately three times more than that converted by B. circulans G22-10 under the same dextran concentration. The B. subtilis host–vector system enabled us to produce CIs by direct fermentation of dextran along with high CITase production, which was not possible in B. circulans G22-10 due to growth inhibition by dextran at high concentrations and limited production of CITase. This study was supported in part by the project “Collaboration of Industry, University, and Government” (Okinawa Prefecture, Japan) and by a Program for Promotion of Basic and Applied Researches for Innovations in Bio-oriented Industry (BRAIN, Japan).